Drive a sleek, high-performance exotic car at top speeds on a professional race track near Los Angeles! 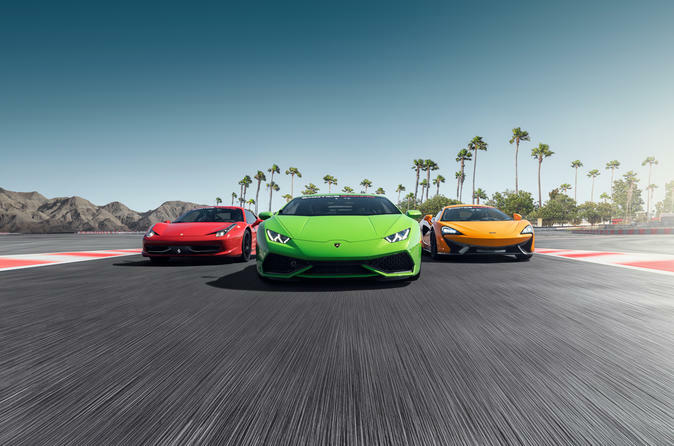 This thrilling package gives you the opportunity to take control of a top-of-the-line Ferrari, Lamborghini, Porsche, Audi or Nissan and drive five to ten laps at the Auto Club Speedway, which hosts both NASCAR and IndyCar races. Pick up racing pointers from your expert driving instructor, and take two practice laps in a Porsche Cayenne GTS before slipping behind the wheel of your chosen race vehicle and reaching speeds of up to 130 mph (209 kph). Your driving adventure takes place 45 minutes east of Los Angeles at the Auto Club Speedway in Fontana, California. This 1.2-mile (1.9-km) racetrack is the site of both NASCAR and IndyCar events and features eight turns and a 1,600-foot (549-meter) straightaway. Begin your dream driving experience with a detailed safety and technical briefing from your expert instructor, who will explain the correct driving position and techniques for steering, accelerating and braking powerful cars like the Ferrari, Lamborghini and Porsche. Next, your instructor will demonstrate how to find the ideal racing lines on the course by driving you around the track on two practice laps in a Porsche Cayenne GTS. Under the guidance of your instructor, hit speeds ranging from 110 to 130 mph (177 to 209 kph) depending on your car and your experience level. Your companions can watch and cheer you on from the spectator area. By the end of your 2.5-hour experience, you'll have done something most people can only fantasize about — driven one of the world's fastest cars on an actual race course.